Fresh strawberries doused in tequila and triple sec for the best summertime drinks yet. 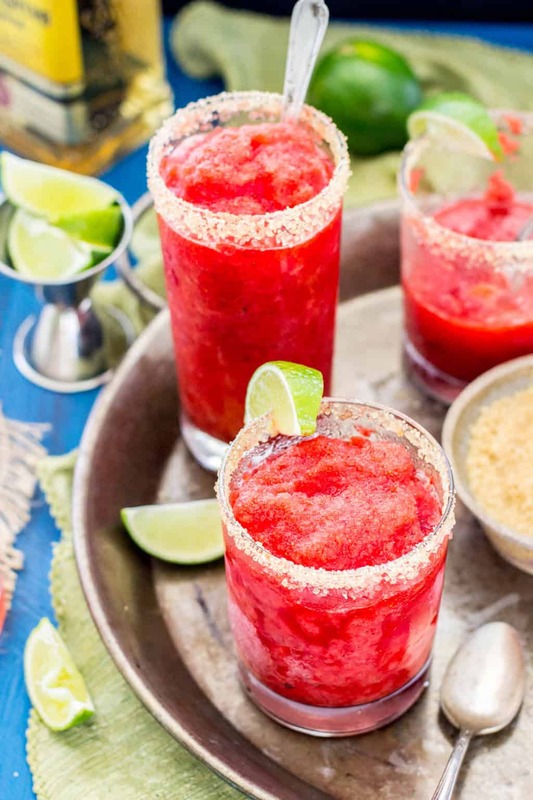 These strawberry margarita granitas taste like slushy (adult) snowballs. Hey hey, it’s the weekend. And according to the weather report, it’s going to be a hot and sunny one. 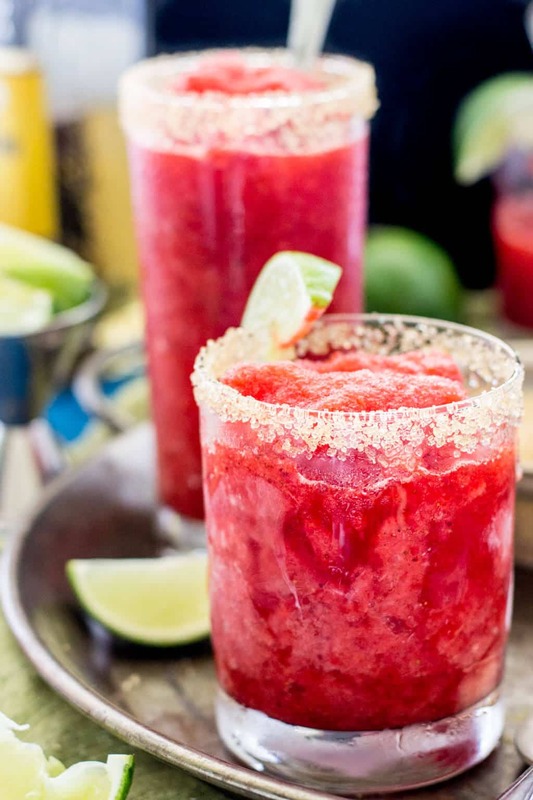 More precisely, how about a strawberry margarita granita? I’ll happily accept a margarita at just about any given time of the day. 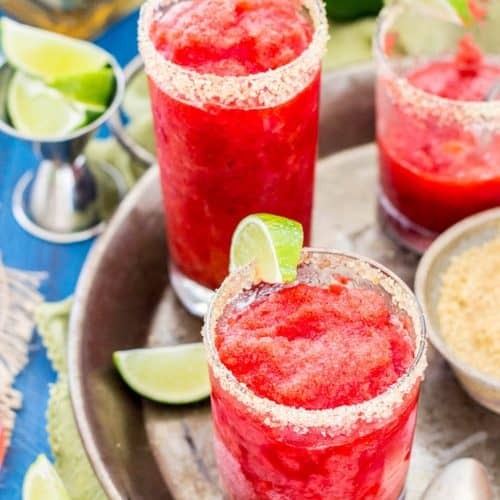 While I don’t drink very much or very often, there’s something about an icy (I prefer my margaritas frozen — always), slushy margarita, tart with lime and feisty with a splash of tequila and triple sec (just enough to make you feel a little dizzy and friendly to everyone around you) that I can’t get enough of. I suspect this may be because margaritas are usually accompanied by chips and salsa and guac, which just happens to be my favorite (non-sweet) food on the entire planet. 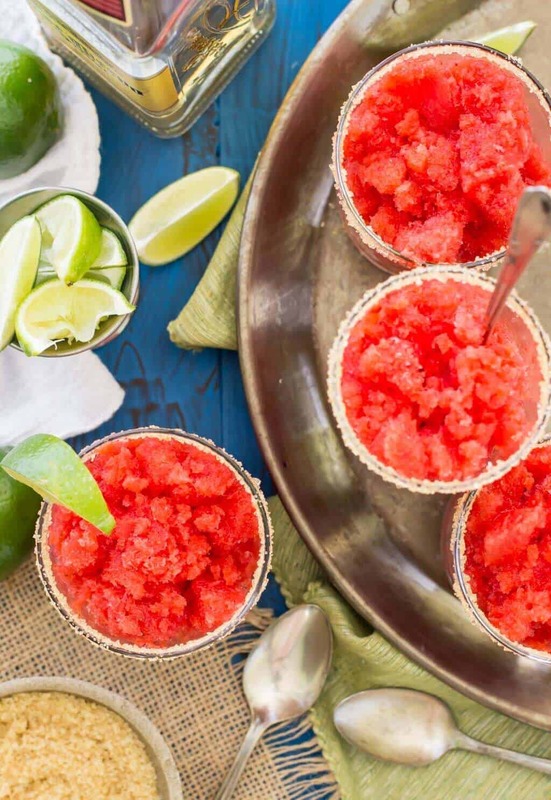 Unlike your typical margarita, though, these granitas have a few subtle differences. I’ve introduced granitas on SSR before, but if you don’t remember they’re slushy frozen treats, chilled in a 13×9 pan and scraped up with a fork. 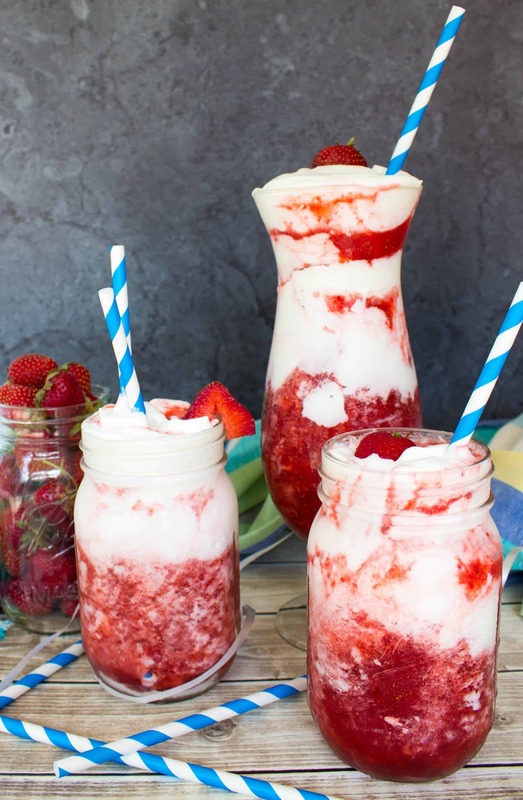 Toss them in a glass (rimmed with sugar, if desired) and eat with a spoon like a tequila-infused, strawberry-saturated snowball. I have a preference for clear spirits (if only because dark spirits turn my stomach ever since a particular tailgating incident at Penn State a few years ago… I also can’t drink Coke anymore), so I used silver tequila here. 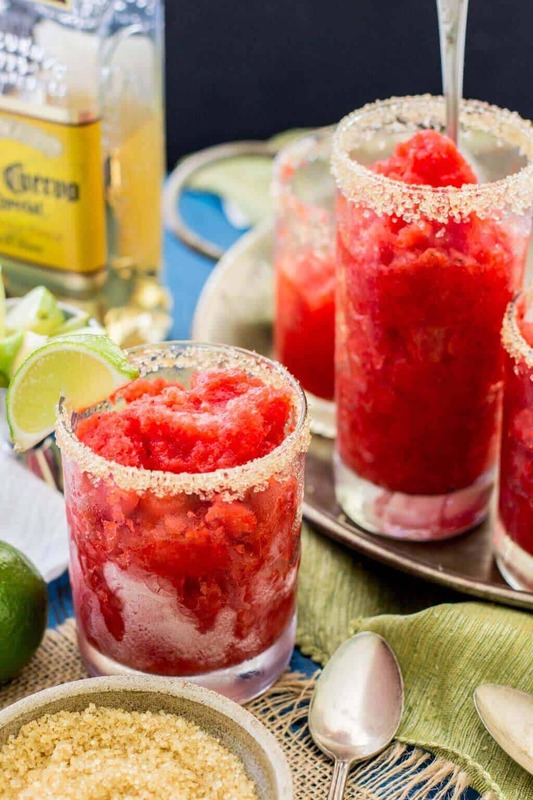 This works well for this granita because the main flavor attraction is the fresh strawberry, and you’re unlikely to get caught up on the subtle intricacies of the tequila itself. However, if you only have gold handy that will work just fine, too. In a medium saucepan over medium heat, dissolve the sugar into the water, stirring constantly. Remove from heat and add the tequila, triple sec, and lime juice. Pour your tequila mix into your straberries in the blender, and pulse until well-combined. Pour the mixture into a 13x9 glass dish, cover, and freeze for 1 hour. 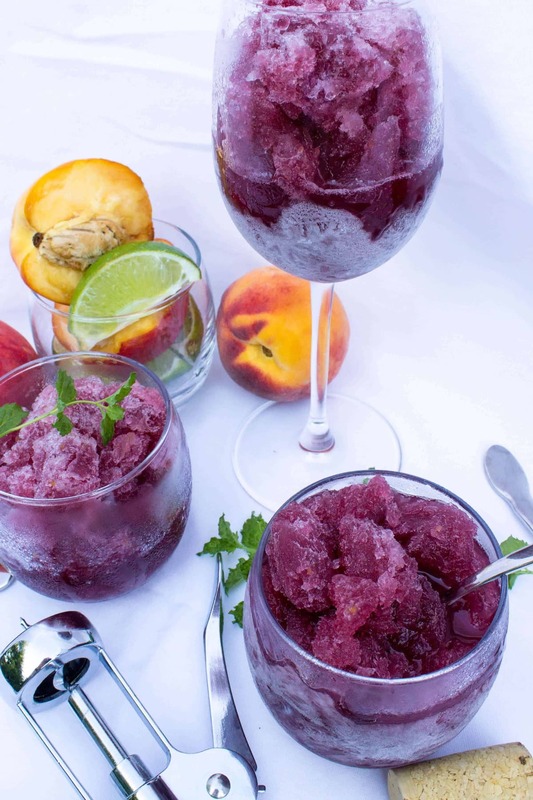 Remove at the 1 hour mark and use a fork to stir up the slushied contents of the granita. Return to freezer and freeze at least 2 more hours, stirring/scraping again with a fork every 30 minutes. Use a fork to break up the granita again before serving. *If desired, run a lime around the rim of a glass and dip in sugar (I used turbinado sugar) before serving.